The Tim Hortons Ottawa Dragon Boat Festival is once again returning to Canada's capital to kick off the summer, and details for this year's edition of the Ottawa event have just been announced. 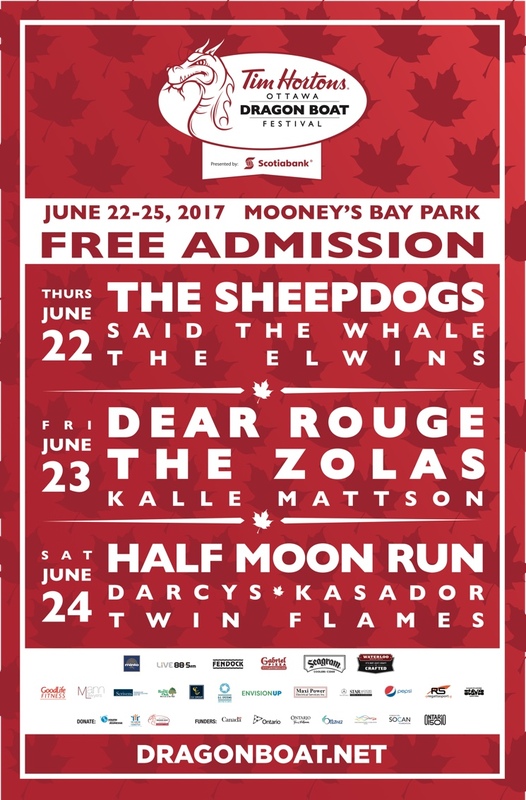 The weekend-long event will take place from June 22 to 25 at Mooney's Bay Park, and in addition to featuring an esteemed dragon boating regatta, there's also stellar lineup of free concerts in store. The shows will take place across three nights, kicking off on the Thursday evening (June 22) with sets from the Elwins, Said the Whale and the Sheepdogs, followed by Friday night (June 23) performances from Kalle Mattson, the Zolas and Dear Rouge. The musical portion of the festival will wrap up on Saturday (June 24) with one last show boasting Twin Flames, Kasador, Darcys and Half Moon Run. For full information on the upcoming events, check out the official Tim Hortons Ottawa Dragon Boat Festival website.